Achieving the revenue growth that markets expect can be challenging: growth by acquisition is expensive, and organic growth is often too slow and incremental. Therefore, a key priority for global corporations is to improve performance in breakthrough innovation to overcome the growth gap. However, despite some successes, many companies fail to create sustainable new businesses of scale. For example, in our own breakthrough innovation survey 11 , more than 85 percent of companies were unsatisfied with their breakthrough innovation performances. Usually, this is not due to lack of good concepts, but because companies do not truly embrace the idea of investing in step-out business opportunities which involve commercial risks and require new competencies. Arthur D. Little (ADL) has been working with clients using a powerful new external incubator approach to overcome these challenges and accelerate new business creation. applied specifically to innovation and product development. 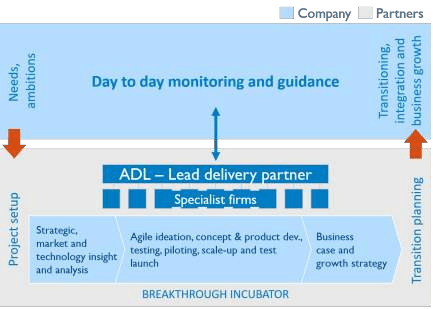 Once the development is complete, ADL transitions the proven and tested new business from the incubator back into the company.